Heavy lake effect snow east of the Great Lakes is likely this weekend. Little to no accumulations are expected in the Finger Lakes. A shot of wintry weather will invade the region this weekend. As the cold air flows over the warm waters of the Great Lakes, lake effect snow will develop. Winds will be westerly, so lake effect will set up due east of the lakes. For Lake Erie, west winds produce marginal events, but it is a prime set up for snow off of Lake Ontario. 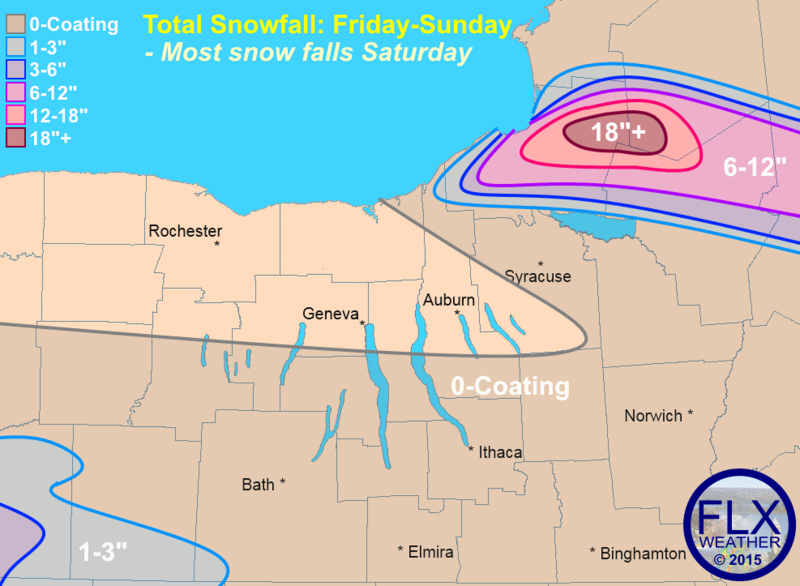 Maximum snow amounts off of Lake Erie this weekend should be in the 6-10″ range (not shown on the map above), but as much as two feet could fall across the Tug Hill east of Lake Ontario. Most of this snow will fall on Saturday, but lake effect will begin in earnest tonight and should dissipate Sunday morning. For the Finger Lakes, there will be little more than a couple of flurries floating by off of Lake Erie. The northern Finger Lakes will probably not see any snow at all, while the southern half could see a coating if a heavier snow shower moves through. High temperatures will be in the 30s for the next few days, with upper 30s Friday and Sunday and low 30s on Saturday. Saturday will also be very windy, with gusts of 40mph much of the day. This will keep wind chills around 20 degrees- a far cry from the 60s and 70s earlier this week! Warm weather will start to push back north early next week. Temperatures should reach the 40s on Monday, with 50s possible after that. It would not be a surprise to see 60 degrees at least once more before the new year.